Berlin (Reuters): At least 12 people killed while 48 other injured as a truck crashed into a crowded Christmas market in central Berlin on Monday evening. According to details, a black truck crashed into a crowded Christmas market on Breitscheidplatz square near the fashionable Kurfuerstendamm Avenue in the west of Berlin, Germany, causing massive destruction and casualties. 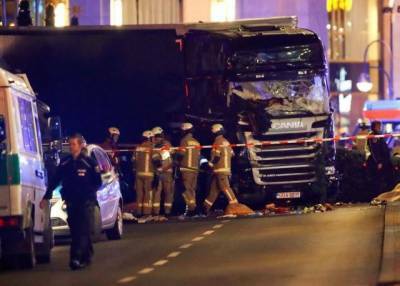 German media reported that the truck veered into the market around 8 p.m., normally a crowded time when adults and children would be gathering in the traditional cluster of wooden huts that sell food and Christmas goods in an annual celebration. One suspect had been taken into custody and that another passenger from the truck had died as it crashed into people gathered around wooden huts serving mulled wine and sausages at the foot of the Kaiser Wilhelm memorial church in the heart of former West Berlin. Police said that the nationality of the suspected driver, who fled the crash scene and was later arrested, was unclear. People at the market said that they heard a loud bang. A lorry (truck) crashed through the stalls, through people. The truck seemed to be traveling at about 40 mph (65 kph). Black truck smashed the Christmas decorations. In the aftermath, it was resting lopsided on the pavement with a mangled Christmas tree beneath its wheels. Berlin police said they were investigating leads that the truck had been stolen from a construction site in Poland. The White House on Monday condemned what it called "what appears to have been a terrorist attack". German government officials have said the country, which accepted nearly 900,000 migrants last year, many from the war-torn Middle East, lies in the "crosshairs of terrorism."